Simon Wittenberg heads to St.James’s Street to sample Avenue’s cuisine which stems from the culinary regions that surround the “Ring of fire”, the volcanic belt containing more than 75% of the world’s active and dormant volcanoes. Avenue Restaurant and Bar was first unveiled in the nineties with more of an American theme by the former investment banker, Chris Bodker. It was then re-launched 12 years later by current owners, D&D London, after they bought Bodker’s Image Restaurants group. Today, the eatery serves Asian-derived cuisine with a fiery South American twist, and the spacious and airy, although dimly-lit, 112-cover restaurant revolves around the spectacular and central illuminated chandelier which sparkles with wine glasses. Head Chef, Andras Katona, who has also worked at The Savoy amongst other establishments, is in charge of overseeing the busy kitchen. We visited Avenue for dinner on a Saturday night, and there was a reasonable choice on the à la carte to suit most palates, but guests can equally opt for the set menus (costing £20 for two courses and £25 for three) which are accompanied by wine and champagne respectively. Although we didn’t have the opportunity to sample the Decanting Bar’s very latest cocktail menu conceived by Avenue’s Head Mixologist, Davide Arcucci, before we sat down for our meal, I did nevertheless enjoy the nicely and theatrically-concocted “From London” creation (£11.50) made up of the Kamm & Sons botanical spirit, St. Germain elderflower liqueur, fresh mint and strawberries and fizz. My guest headed for the rather strong and comparatively more alcoholic “Journeys to a far” (£11) whose prime ingredients are Johnny Walker Black Label Scotch whisky, Aztec chocolate bitter, sugar and fresh mint. After chatting over our beverages and devouring a healthy portion of salted nuts, we were seated by our host on the raised “mezzanine” level of the restaurant where you can catch a glimpse of the floor below. The wooden tables are furnished with comfortable beige leather chairs, and visitors are serenaded with contemporary music from the very talented solo artist, which meant that having a conversation could sometimes prove a little difficult. Mulling over the menu with some fresh bread and pimiento butter in hand, we both quickly settled on the sea bass ceviche (£12) from the “Starters” section of the à la carte. The sumptuously smooth fish was served with very finely cut cubes of mango and apple, plus some wisps of avocado purée to finish off the dish. Like mine, my dining partner’s feedback was equally as positive, and we were suitably impressed with what we had just sampled. From the very short wine list (there are only seven different red and white varieties offered), we were treated to a glass of fruity white wine from the Loire Valley which complemented our opening chapter extremely well thanks to our host’s recommendation. When you get to the next course, there is the “Mains” or fish and meat dishes from the “Robata Grill” section (robata is a Japanese method of cooking which is similar to a barbeque). Joined by a side of fries (£5), I opted for the latter and went for squares of miso-glazed tuna (£27) which were lightly seared and topped with a sprinkling of black and white sesame seeds. It was accompanied by delicate crisps as well as a delicious and slightly spicy tomato and olive sauce. My guest’s native lobster (£46), also from the Robata section, was both flavoursome in taste and beautifully presented, but did prove to be more hard work than he had liked to extract the meat from the shell. Known for having a sweet tooth, I couldn’t resist a dessert, and there was everything from passion fruit tart to apple and rhubarb rice pudding. 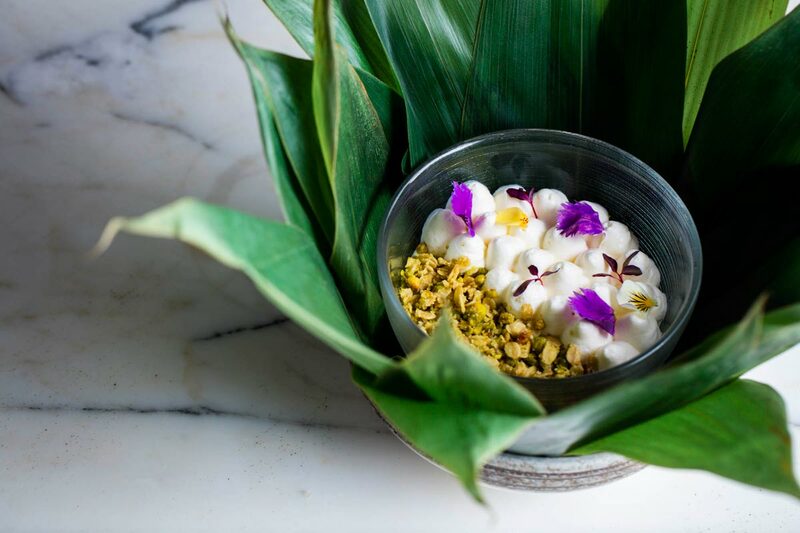 I proceeded to polish off the twirls of Madagascar vanilla-poached pineapple carpaccio (£8) which was elegantly decorated with edible flowers, a delicate dried pineapple crisp and a refreshing coconut sorbet. My companion for the evening went for the savoury option and worked his way around the Bellevaire cheese board (£11.50) which was very well matched with his small glass of Graham’s “Six Grapes” Port (£6). All that was left to do now was to savour the complementary mini chocolate tarts, and to reflect on what had been a superb meal from start to finish. Avenue Restaurant and Bar is tucked away from the hustle and bustle of Piccadilly. For those willing to make the effort to peel away from this main thoroughfare, they are rewarded with a restaurant that offers something a little different in terms of flavour and composition, as well as attentive and first-class service. Avenue Restaurant and Bar – Where and How? The Avenue Restaurant and Bar is located at 7-9 St James’s Street, London, SW1A 1EE, United Kingdom. For more information, or to make a reservation, e-mail avenuereservations@danddlondon.com, visit www.avenue-restaurant.co.uk, or call 0207 321 2111.